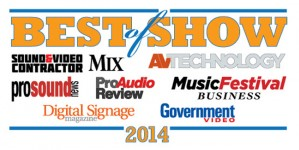 AV Technology magazine, published by NewBay Media, announced its Best of Show Award winners at InfoComm 2014. NewBay Media’s Best of Show Awards are judged by a panel of AV/IT technology managers, AV systems integrators, and industry experts from submitted nominations. Criteria include ease of installation, ease of maintenance, anticipated reliable performance, richness of the feature set, relevance in the marketplace, value proposition/ROI, network friendliness, and versatility. "With thousands of new product introductions at InfoComm 2014, more than 37,000 attendees, 218 new exhibitors, nearly 200 award nominations, our 'Best in Show' Awards help spotlight best-in-class innovations," said Margot Douaihy, editor, AV Technology & EDUwire. "We congratulate the winners and their commitment to the needs of tech managers and end-users." Winners will be featured in our special post-show eBook. See the official rules. For more information, contact NewBay's creative director, Anthony Savona.